A safe space where you can work through your feelings of loss, hurt and grief, whether recent, or long ago. The purpose of this group is to provide a safe and compassionate space to share, connect, and learn from others who have had a similar experience. With tools and insight provided by a supportive therapist, group members will have the chance to share experiences, explore feelings and move beyond hurt, and repair relationships through the use of metta (loving kindness) meditation and modern therapeutic tools -- including The Five Secrets. We do deep experiential work in these sessions, so this group is not for everyone. 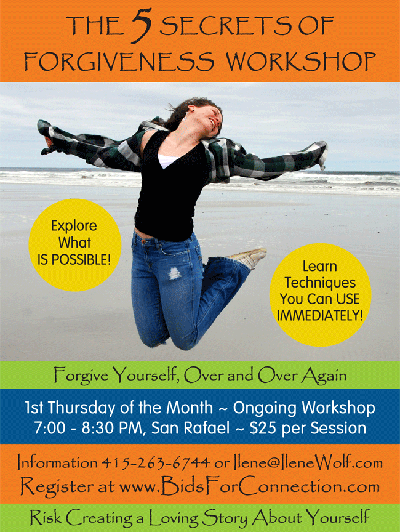 Practicing The Art of Forgiveness Group meets the first Thursday of the month in San Rafael. Please call to reserve your space. Individual session required to ensure that this group meets your individual goals. Requirements and Recommendations to join The Art of Forgiveness Group: One $50, thirty minute session with group leader is required, to be arranged prior to attending the group. A minimum of a six month commitment is encouraged to benefit from the support of the group.